« Colour, Texture, Magic…and a little decadence too! Canes: An elegant expression of style and function. In a different place and in a different time, men of a certain society could easily be distinguished by how they looked and what they wore. In his fur felt homburg or shiny top hat along with his tailored waistcoat or smoking jacket, a gentleman’s sense of style and elegance could not be missed. And, regardless of the event, he was never without a cane to match his outfit (e.g., basic for strolling, silver-topped for calling in on friends or gold-headed ebony for the opera). In the 19th century (and early 20th century), canes were not carried, they were “worn” by men of means. The right cane could clearly announce their status and place within society. As a result, canes like any other fashion accessory, came in many shapes and sizes but were crafted with great care and always with a sense of style. And, much like a woman’s purse they also became quite utilitarian. It was not uncommon to have canes with secret compartments to stash a flask, hold a snuffbox, or even conceal a weapon. 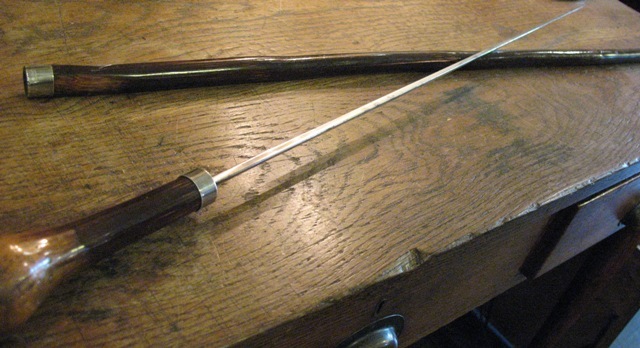 These canes, most commonly known as “gadget canes” became quite popular. And, during the mid nineteenth century with the dawn of the “mechanical industries”, canes began to include the most remarkable selection of items within their now hollow shafts. According to Catherine Dike in her book dedicated solely to canes, Cane Curiosa, gadget canes can be broken down into four main categories of use: serious outdoor walking, city use, professional, and as a weapon. The outdoor walking stick would be simple yet sturdy, often quite rustic looking and might have a picnic set, fishing pole, a backgammon game, or even small chair tucked away in the shaft. The “city” cane would be more elegant and ornate and might have a cigar case, spittoon, a watch, or perhaps a violin neatly concealed inside. Professional canes would tend to be more practical and carry items such as a conductor’s baton, a hammer or saw, a complete paint set with brushes, or even pharmaceutical tools and doctor’s implements such as a stethoscope, syringe and pillbox. The weapon canes were even more intricate, as it would take some serious design ingenuity to craft a cane that housed guns and swords. Some weapon canes were a bit more subtle, built with solid knobs at the top that could be quite unassuming to the untrained eye. But, these “knobkerries” or “knob sticks” could easily bludgeon someone to death with enough force. Sword canes came in many shapes and sizes, some even having both a stiletto blade and a firearm enclosed within the shaft. 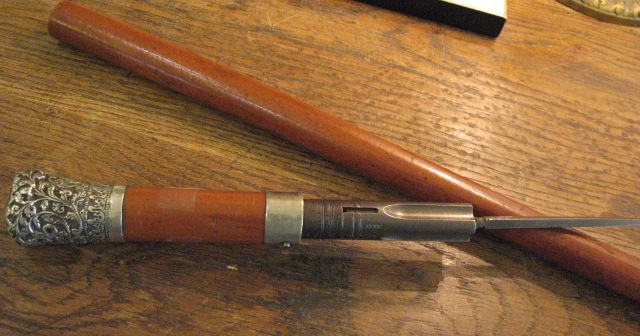 Gun canes were also all quite different and included flintlock guns, percussion firearms and breech loading guns. In their day, gadget canes were cherished and worn with great pride and style. Somewhere along the way, however, multi-purpose canes slowly disappeared and reverted back to being practical walking sticks for people of all ages and class. Some suggest that this would have been around the time of the First World War. Fortunately, their appeal as a collectable has not dwindled. In fact, if anything they are now in extremely high demand and sought after by a very select group of international collectors and antique dealers. This is a rather large set of individuals, with cane conventions popping up all over the world on a yearly basis. As a result, finding original gadget canes from the 19th century is becoming increasingly difficult. Not long ago, a rather large unprecedented collection of original and mint condition canes came up for sale by a European collector who was in his late nineties. This sale drew the attention of many collectors and dealers, as he had collected close to 300 19th century canes, many of which were gadget canes, during his world travels and throughout his lifetime. There was much interest and many offers, but in the end it was a Vancouver dealer who managed to secure the deal. The dealer, who wishes to remain anonymous, has kept part of the collection but has been selling off the rest privately and through Bakers Dozen Antiques in Vancouver. According to Heather Baker, the owner of Bakers Dozen (3520 Main St. Vancouver) and respected antiques dealer, “it is quite exceptional to see this kind of quality and quantity in 19th century canes. 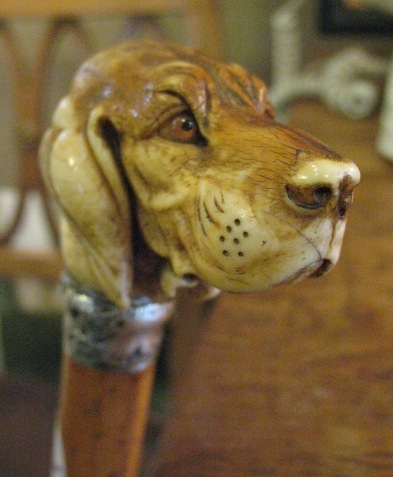 Each cane is so special and you know that the collector took great care in selecting the pieces for his collection.” Some of the collection was recently sold at the Kerrisdale Antiques Fair in Vancouver and about 27 are now on display at the store on Main Street. Prices vary from $300 all the way up to close to $5,000 for the more hard to find canes such as the gun canes. 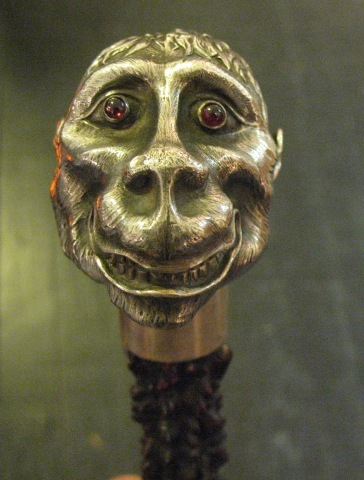 There are even some “naughty” canes in this collection, appealing to the more daring collector. 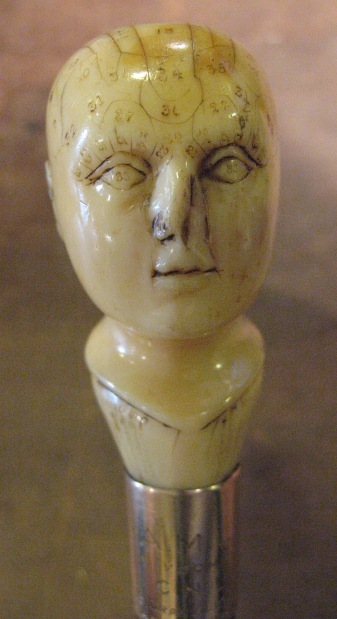 The piece that has caught Heather’s eye is a rare ivory phrenology cane. Considered as pop psychology in its day, phrenology studied personality traits and intelligence by literally measuring the bumps on someone’s head. It was all quite scientific but never quite proven as a reliable field of study. However, phrenology paraphernalia still intrigues many today. In her store, Heather has quite a few other references to phrenology, so having an actual phrenology cane was quite exciting for her. Heather is not sure how long the canes will remain in the store, but hopes more people will come in to see them first hand and appreciate the intricate craftsmanship that went into making them. It may no longer be a sign of your place in society, but owning a gadget cane would certainly set you apart from other collectors. great blog! I’m so glad I found this local blog. Teaches me so much about the place I live!